A Lake Elsinore man was arrested on drug and burglary charges and a transient woman was arrested on drug charges after a traffic stop in Murrieta on Sunday, police said. 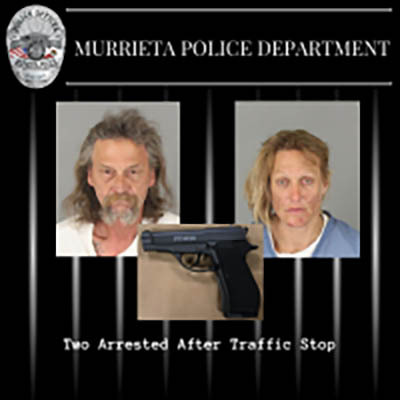 Archie Clausen, 59, and Nicole Woodhouse, 37, were the occupants of a vehicle stopped by Murrieta Police at 10:59 p.m. in the area of Jefferson Avenue and Cherry Street. The officer observed a silver handgun on the floorboard near the driver and, with assistance of several officers, he detained the suspects, according to a news release. A records check showed that Clausen was out on bail on theft related charges and on probation for theft and narcotics charges. In a criminal history dating back 27 years, Clausen had convictions for theft, narcotics and fraud. Woodhouse was on probation for vehicle theft and had previous convictions for vehicle theft, narcotics and burglary in California and Washington. A search of the vehicle revealed the handgun and tools commonly used in burglaries. Clausen was found to be in possession of methamphetamine and credit cards stolen from five different people. Woodhouse was in possession of heroin and a syringe, police said. The suspects were booked into Southwest Detention Center for possession of narcotics, and Clausen faces additional charges for burglary. The handgun, shown in the attached photo, was found to be a pellet gun, which is not illegal. However, police caution residents about the dangers of having a firearm of any sort in a vehicle. They urge proper storage and handling of weapons for those who choose to legally carry a firearm in their vehicle.